This windswept isle off the coast of Auridon has long been shrouded in mystery. Rumors of magical traps and sudden storms deter even the bravest of sailors. 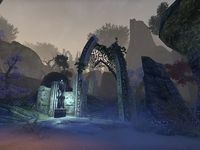 Dranil Kir is an island off the coast of Auridon formerly occupied by the Psijic Order that houses the Psijic Obscuros, a powerful scrying device. The island is only accessible during the related quest and cannot be returned to. Meet the Character - Divayth Fyr reveals that Divayth Fyr tried to perform a Daedric ritual on the island before Lilatha interrupted it. This page was last modified on 8 January 2019, at 23:28.